When Amanda Garzon was making preparations to host the third annual Hydrocephalus Association 5k Run/Walk on September 29, she knew that many of the runners participating would not have a first- hand knowledge, or even an awareness of the disease. Many would be standing on the starting line on the mild Saturday morning in late September mainly because they were searching for a local, flat, and fast 5k race to include in their competition schedule. At the same time, however, Garzon, the Co-Chair of the race and the Director of Media and Marketing for the Hydrocephalus Association (HA), hoped that by drawing local attention to the HA cause, she could raise awareness and build support for finding treatment and a cure for the disease. Garzon knows all too well about the impact hydrocephalus can have on lives. Her 13-year old daughter, Gabriela, has suffered from the disease since she was a baby, and has had 15 brain surgeries. Hydrocephalus, a condition characterized by the buildup of fluid in the ventricles of the brain, afflicts over one million Americans. Anyone can get hydrocephalus, at any age, and there is no cure. The primary treatment is the implantation of a shunt in the brain, a surgery with a high failure rate requiring repeated revisions. By hosting the event at East Potomac Park in Washington, D.C., the Hydrocephalus Association was able to raise over $62,000 for the cause, and attract more than 550 participants. In addition to the 5k Run/Walk, the event also included a Kids Fun Run and a performance by Annie Baney, a Nashville area singer-songwriter known for her alternative pop-country style. Leading the race was celebrity lead runner Wilson Komen. Komen, 35, a native of Kenya and 2:17 marathoner, is a professional distance runner, local running coach, and sales representative at Georgetown Running Company in Washington, D.C. He finished smoothly (and apparently effortlessly) in a time of 16:26.7. Komen learned of the race through DC-area resident Hollin Dwiggins, who suffers from hydrocephalus. He says he was inspired by her story as well as those of other hydrocephalus survivors, and wanted to help build awareness for their cause. Komen recruited five of his athletes to run the race, including Joe Fisher, who finished 6th overall in a time of 18:34.8. Fisher was pleased with his performance at the race, noting that he was continuing to build back his fitness level after undergoing rehabilitation for a stress fracture last year. 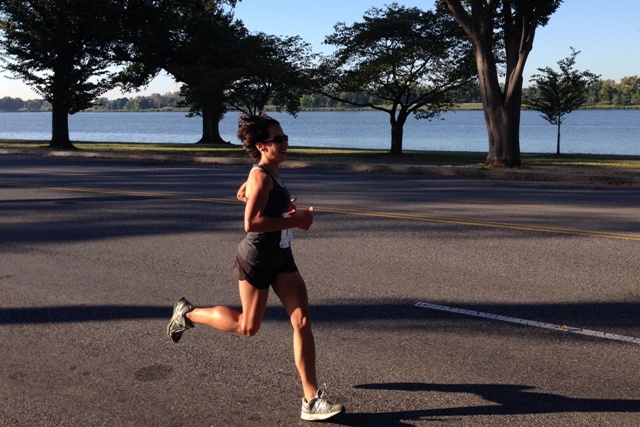 Finishing first overall for the women in the race was DC resident Liz Clapsis, 35, who crossed the finish line with a time of 20:41.3 in her first 5k race ever. Though a runner in high school, Clapsis has only recently getting into road racing, and has been more focused on training for the longer distances, completing the Navy-Air Force Half Marathon on September 14. Clapsis trains with the DC Road Runners and EZ8 Running Group, and was inspired by a friend to sign up for a 5k as a complement to her longer distance training. Finding the HA 5k through a Google search, she was aiming for 7 minute miles, but was pleasantly surprised to find herself the lead runner and finished strong to take the top award. Also running in the race was Jessica Ford, 22, of Ithaca, N.Y. Ford traveled to D.C. for the race in support of HA, where she formerly worked as an intern. A hydrocephalus survivor herself, diagnosed at age 16, Ford is currently asymptomatic and counts herself lucky to have never needed brain surgery. An avid runner, Ford has completed four marathons and her goal is to qualify for the Boston Marathon one day. Making the day a family affair, the Crenshaw family of Fairfax, VA came out in full force in support of daughter Rhyan Crenshaw, 15, who suffers from hydrocephalus. Mom Dawn, dad Calvin, brother Tristian, and Rhyan’s aunt and grandparents all came out to walk or run the race. Dawn Crenshaw notes that while Rhyan has dealt with hydrocephalus since she was eight months old, they have done their best to encourage her to lead as normal a life as possible, to include taking dance classes, playing soccer, and other active pursuits that make her happy.